Thousands of American soldiers and airmen were stationed in East Anglia during WW2. 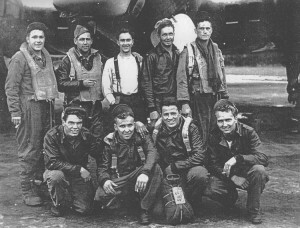 Most of the soldiers left in 1944 on the D-Day Landings, but the airmen of the USAAF remained. They were stationed on the vast airfields which transformed the landscape. Our local airfield, Station 174, lay at the junction of three parishes – Acton, Chilton and Great Waldingfield (where the bulk of the residential and related facilities were located.) It was the home of the four squadrons making up the 486th Heavy Bomb Group. 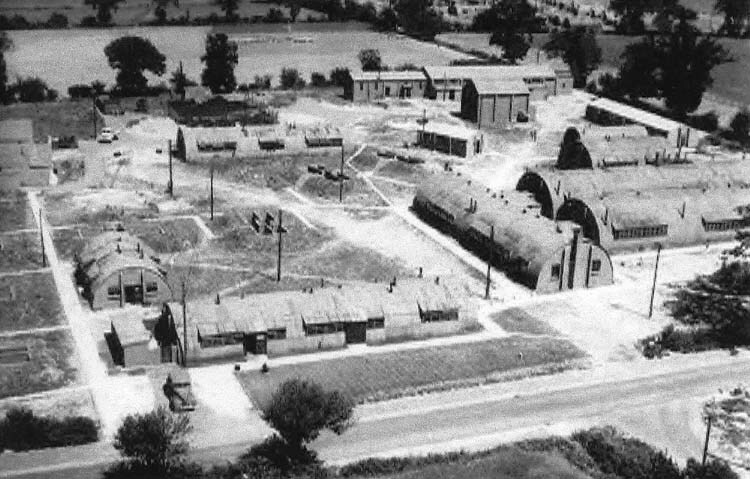 Construction of Station 174 began in 1943 and was laid out on the normal RAF ‘dispersed’ pattern, with facilities widely scattered across some twelve locations – so scattered in fact that American GI’s were to find a bike essential for getting around the base. Although built for the RAF Station 174 was always intended for eventual handover to the Americans. The main contractor was John Laing and the construction cost over £1 million, perhaps £80 million at today’s prices. F.G.Minter Ltd was responsible for the work on the domestic sites whilst the local firm of Bulmer Brick and Tile Co Ltd, run by L.A.Minter, was responsible for supplying all the bricks and land drain pipes: many of the bricks came from Peterborough and on arrival at Long Melford station were ferried to the site in fleets of lorries. 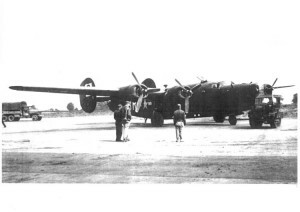 A large workforce of Irish labourers worked to build the three intersecting concrete runways, the 50 hardstands for the aircraft, hangars, bomb and fuel stores, control tower and all the facilities which would be needed to house, feed and entertain the airmen and ground crews who would eventually live on the base. Some of these Irish labourers became a familiar sight in Sudbury on Thursdays when they came in with their laundry, perched on the back of an ancient solid-tired lorry of WWI vintage and still towing a cement mixer behind. 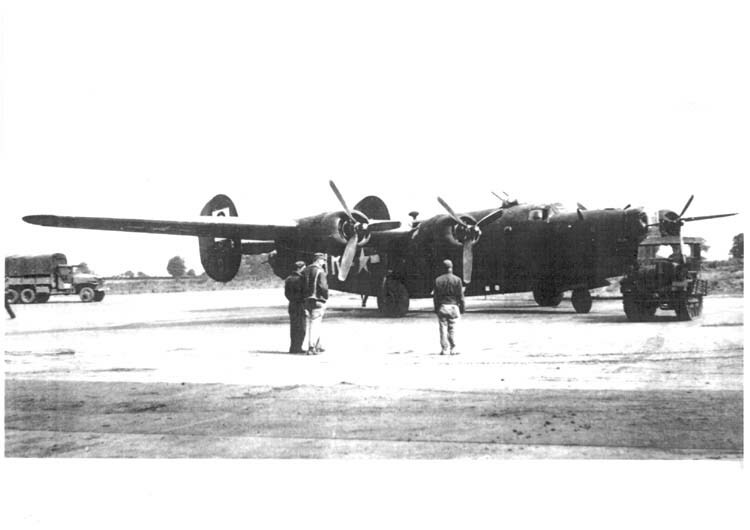 Eventually the base was ready and was handed over to the American Air Force on March 23rd 1944. Some American servicemen had arrived early, coming from Arizona to endure a cold, wet English winter in Nissen huts heated by a tiny coke stove that was difficult to light and impossible to keep in overnight. The unheated washrooms and primitive bucket latrines added to their misery. Eventually Spring came, the daffodils began to bloom and their spirits lifted when the first of the 52 B-24 Liberators flew in on April 2nd 1944 from their temporary base at RAF Valley in Wales. Among the local people who witnessed the arrival of these huge and deafening machines was a local 17-year old named Roley Andrews. He was standing on the Sudbury-Waldingfield road close to hardstand number 25 of the 834th Squadron. Roley and some friends got through the hedge and went up to one of the four-engined bombers. ‘The Pilot, 2nd Lt. Albert Kite, was still in the aircraft. Since his crew was talking to the ground crew, no one took any notice of us. But finally, the crew did turn to us, spoke, and gave us a handshake.’ The airmen all seemed six feet in height, had a lovely tan and spoke like film stars. Roley was smitten. He lingered on the airfield for hours and when he got home never stopped talking about the men and their magnificent machines. Next day he was there again and toured the whole airfield on his bike. Roley was not alone – many local boys found the airfield an irresistible attraction and came to the planes offering to ‘help’. ‘One kid surely did ‘help’ . He picked up a parachute by the ‘D’ ring and the chute popped out with white nylon streaming all over the place’. Rules were soon established that required a pass for anyone wishing to get onto the airfield. Roley never did get a pass but he became like a fixture on the base, developing close personal relationships with several of the mechanics, armourers and airmen. Eventually, some 3,000 men lived on the base; aircrews, the ground crews and engineers who kept the planes in the air, medical staff, military police and a host of personnel dedicated to feeding, entertaining and catering for the many needs of what was almost a small town. Remember that at that time the total population of Sudbury was no more than 7000 and there were only about 250 inhabitants in Great Waldingfield, where most of the new arrivals were housed. The arrival of thousands of Yanks had a deep impact on the lives of the local people, even though they were here for such a relatively short time in 1944-5. Meanwhile, with offensive operations about to begin, ammunition trains arrived at Long Melford station three or four times a week to keep the planes supplied with bombs and ammunition. Trains of petrol tankers also began to arrive at Sudbury station. 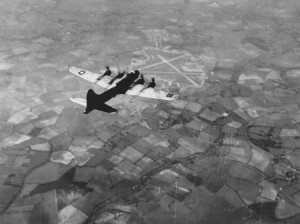 Each Liberator bomber might carry four tons of bombs and consume 3,000 gallons of fuel on a raid and there were eleven other RAF and USAAF stations within a 12 mile radius of Station 174. Never before or since had the single-track railways of South Suffolk been so busy.